The CHA Program in Documentary Filmmaking became the impetus for this special screening of “Step,” which also was aided by Chaz Ebert and her support of the program. Ms. Ebert shared her views and experiences with the program participants during the 5-week course this summer, and became interested in continuing her mentorship with the DePaul/CHA partnership. All factors came together to present this Saturday’s screening of “Step.” The film is FREE and open to public, but is currently registering admissions on a wait list basis only. Click here for more information. “Step” is an award-winning documentary release in 2017, about a group of inner-city and African-American Baltimore high school girls who are part of a charter program in the city, designed to get a Senior class of 100% college acceptances. Within this unique education experiment is the extracurricular dance club of “Step,” a rhythmic and choreographed movement form that often expresses the poetry of their circumstances. One of the issues in the thread of the doc is the Freddie Gray situation in Baltimore, and in a powerful sequence the young women express their Black Lives Matter concerns in their “Step” presentation. Liliane Calfee is an Instructor for DePaul University, after coming from a successful career in the new age industry of digital media. One of the main courses she teaches is on “Digital Media Literacy,” an ever-evolving dynamic that is plugged into our interactions every day. 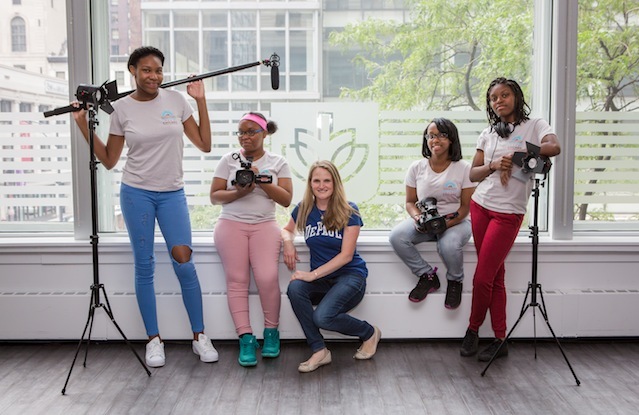 She also helped to develop the DePaul/CHA partnership with the documentary courses for the youth women, and continues to be aware of the issues associated with the development of the program. In the following Podtalk, Liliane Calfee speaks of the connection with Chicago and the themes presented in “Step,” and the importance of support from Chaz Ebert. The special screening of the documentary “Step,” co-presented by DePaul University and Chaz Ebert, will take place on December 16, 2017 (1pm), at DePaul’s CDM Theatre, 247 South State Street, Chicago. Admission is free (see note in second paragraph). For Chaz Ebert’s blog on the DePaul/CHA Documentary Program, click here. For her blog on the film “Step,” click here.